A couple of times a year I get to go camping for my job with Great Old Broads for Wilderness. Yep, it’s pretty darn cool and we (the staff) all agree, these trips are always magical and it’s a treat to get out from behind a computer. It’s hard work, because we’re managing 60 or so participants for these events (we call them Broadwalks)— but it is also great fun and I’ve gotten to meet some wonderful people and see amazing landscapes. 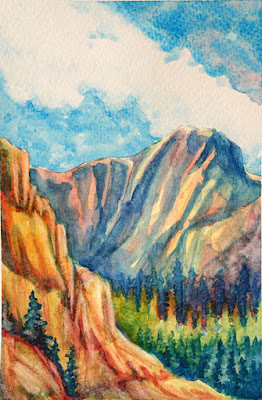 I teach watercolor classes at these events and I really enjoy these sessions. I start out with a little discussion about color and planning the painting, and then do a demonstration before everyone digs in to their own paintings. If I can convince them, the students share their work with the group when we all gather for dinner and the evening program. After four painting sessions this last trip, I had a couple of demo pieces that had the potential to become finished paintings—and here they are! For this adventure, we went to the Sawtooth National Recreation Area near Ketchum, Idaho to learn about the Endangered Species Act and some of the creatures whose survival is threatened. We camped in the beautiful Silver Creek Meadow—a broad expanse bordered by a breathtaking, rocky ridge. 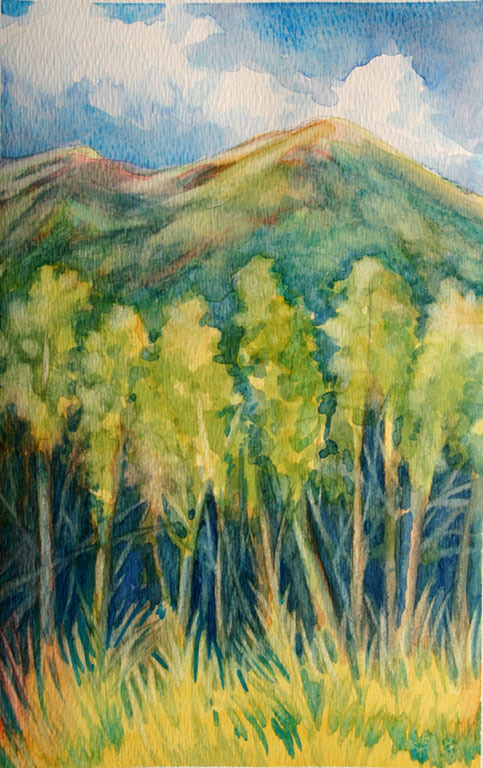 At the edges of the meadow, the aspens glowed in a symphony of greens in the morning sun. 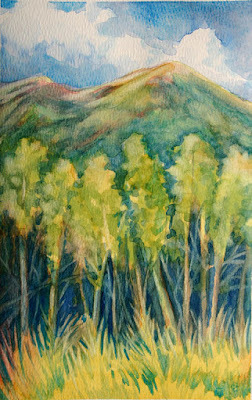 This is the other painting I completed that was started in one of the watercolor class demonstrations. This is but one tiny section of a ridgeline that ran as far as we could see from left to right. Its color and texture changed throughout the day as the sun and clouds moved across the sky. It was one of the loveliest locations I’ve experienced so far on one of our events. However, now that I think of it, I say that about nearly everywhere we go.